Following on from the huge success of The Day of The Doctor, the 50th anniversary special that was watched by over 12 million viewers across BBC One and BBC iPlayer, anticipation is building for the arrival of the new Doctor, Peter Capaldi, who will touchdown in the TARDIS this August on BBC One. 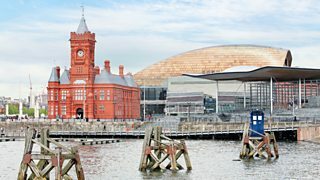 Rhodri Talfan Davies, Director BBC Cymru Wales said: "Where better to start the World Tour than the Doctor's home for the last decade? The sight of the TARDIS and marauding aliens is now a familiar part of Welsh life - though they still scare the life out of the traffic wardens. There is a real sense of excitement and anticipation about the new series – and I know Peter and Jenna are going to be a breath-taking new team. Roll on August!" Filming is well underway on the new series, with guest stars confirmed to join Peter Capaldi and Jenna Coleman including Frank Skinner, Ben Miller, Tom Riley, Keeley Hawes and Hermione Norris. Doctor Who is made by BBC Cymru Wales. Doctor Who Wins Banff Awards!